I can only apologise profusely for leaving it so long between writing my last Bat Rep and writing this one I’ve not really attended many tournaments between October last year and now. I’ve fallen out of love with the Kingdom of Equitaine, too much rubber lancing going on for my liking and the UK meta doesn’t seem to favour great big units of knights (which is the only way I want to play them), so it was back to the Warriors after they received an update in November. I did attended one in Stockport, UK, in December using Warriors of the Dark Gods and then they updated the army book so I decided not to write up. Then attended the excellent Scottish Championships last month and had a blast with my Warriors but then they updated the army again so I decided not to write that up. The constant updates is great but does make bat reps feel old very fast as I’m not sure if anyone is interested in reading how an army does once it’s already outdated. If anyone is interested then leave a comment and I’ll try and write up the good ones. Anyway, onto the main topic at hand, I attended the English Championships last week. It had 90 attendees so the there was a lot of competition. I was using the latest update of the Warriors (2.1.1) and can I just say I think this is the best iteration of the book for a long time, the improvement to the discipline of most of the troops is a huge plus and no longer having to take a very expensive BSB is a big bonus (although my BSB model now feels very unwanted). The Favours are definitely worth taking now I think with a nice price reduction as well as making the champion a little bit more survivable and giving him a nice buff to his discipline. The Dark Prelate gift was calling to me so I definitely wanted to take that, which in turn led to getting a Chosen Lord on a War Dais to sit in a big block of Warriors with the Favour of Envy. So I had what I would consider a fairly fast army, hoping I could get to grips with the enemy as soon as possible and start chopping them to bits. I only had 3 scoring units which could be a problem in certain scenarios but those scoring units are fast and tough so hopefully they can survive whatever is thrown at them and run onto objectives and stay there. So onto Game 1 and i was drawn against Daemon Legions, not an army I have had a lot of experience fighting against and I haven’t played them since their latest update so I was in for an interesting match. After furiously reading the army book and speaking other players I had a vague idea for a battle plan; avoid the Omens until it’s time to strike, blow the Bloat Flies up with magic and fight them with high toughness guys (Feldraks and Forsaken One), don’t get charged by the Brazen Beasts. Easy! The deployment type was Refused Flank and the secondary was Secure Target. We took turns deploying until I decided to drop everything and give my opponent first turn. I’m finding going second is beneficial for objectives where you have to be the one securing it at the end of the game, you can either secure it or stop your opponent from securing it. That was the idea anyway. I didn’t take pics of deployment but here’s the map. 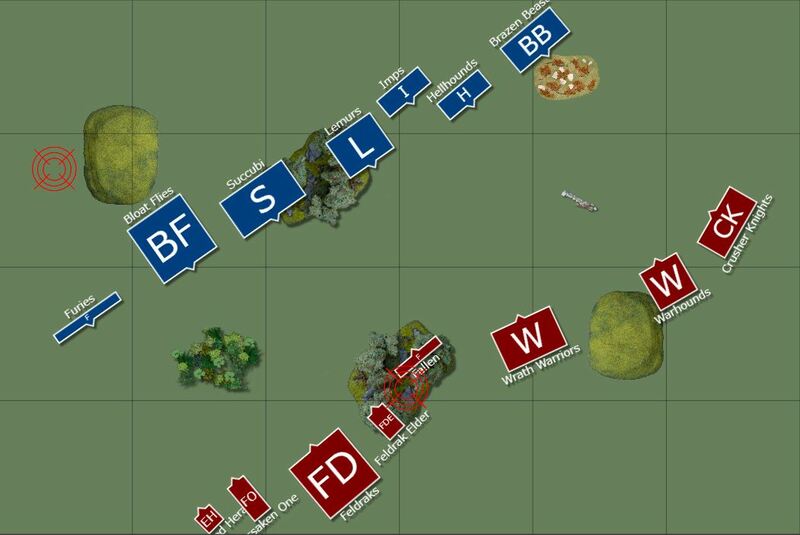 I was pretty much on the line on the left flank but sat back a bit on the right flank after my opponent put his Brazen Beasts down, it’s going to be a bit of a standoff on that side. I have given my Exhalted Herald the Abiding Spirit and Brand of the Dragon Manifestations and spell wise I have gone for Smite the Unbeliever (to lower the toughness on those Flies), Breath of Corruption (not great against Daemons but hoping that a Breath Weapon in combat can help boost some combat res my way) and Hellfire (excellent damage spell against Daemons that have no armour). The Divination Omen, who is the General, is in with the Lemurs and has 4 spells; The Stars Align, Know Thine Enemy, Unerring Strike and the Daemonic signature Spear of Inifinity. The Thaumaturgy Omen is in with the Succubi and its 4 spells are Hand of Heaven, Smite the Unbeliever, Cleansing Fire and Spear of Infinity again. I played a game using a list submitted by "Jimbo81"
On this week's episode of MGR, Andrew and Paul are once again joined by Tom Uden to discuss the recent Scottish Championships! Taking a more thematic approach we discuss the winners and the losers as well as tournament prep, list building strategies, our MVPs & LVPs, what our top ABs are right now and just how you deal with those, ahem, "awkward" tournament players? Tune in for minimum insight and maximum entertainment! And the Scottish 9th Age Twitter for pictures from battle reports, events etc.